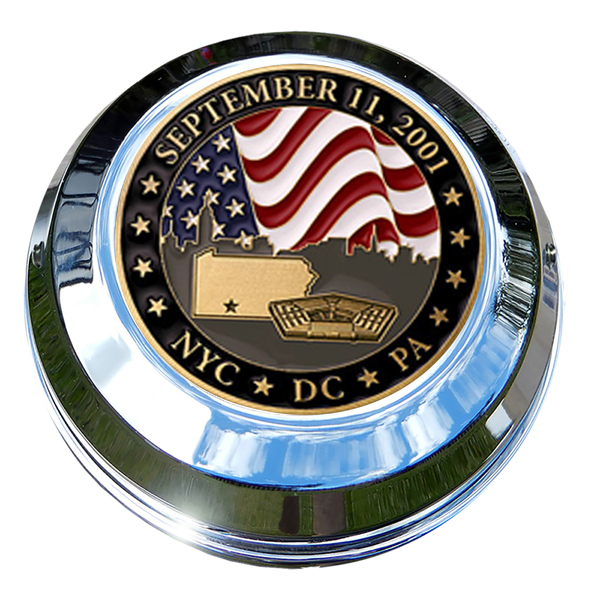 MotorDog69’s Set Screw Gas Cap Coin Mount with “September 11th Commemorative” coin. · Coin and coin mount attaches to your own stock Indian Gas Cap. Fits all Indian models with a stock gas cap. Personalize your Indian today. · Bundle Includes; Set Screw Gas Cap Coin Mount, Challenge Coin Shown, Set Screws, Allen Wrench, and Easy to Follow Instructions. Customize Your Ride! · Kit Benefits; Easily mount and remove challenge coins to personalize your own stock Indian Gas Cap. · MotorDog69 Is The Inventor and Designer Of The World's 1st Adaptable Challenge Coin Mounts For All Motorcycles And Vehicles. "Mount a coin, ride with pride, pop coin out, re-mount a new coin, get a new personalized look."